What s so special about design patterns? At any given moment someone struggles with the same software design problems you have. And chances are someone else has already solved your problem. This edition of Head First Design Patterns now updated for Java 8 shows you the tried-and-true road-tested patterns used by developers to create functional elegant reusable and flexible software. By the time you finish this book you ll be able to take advantage of the best design practices and experiences of those who have fought the beast of software design and triumphed. What s so special about this book? We think your time is too valuable to spend struggling with new concepts. 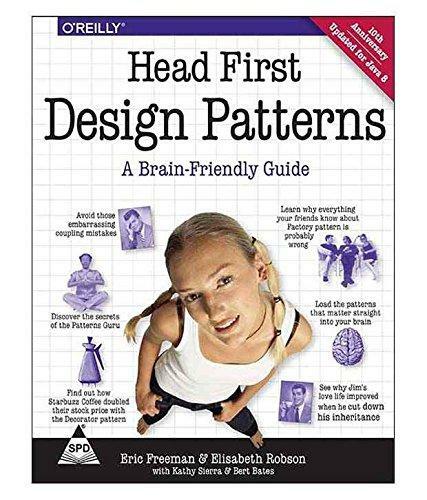 Using the latest research in cognitive science and learning theory to craft a multi-sensory learning experience Head First Design Patterns uses a visually rich format designed for the way your brain works not a text-heavy approach that puts you to sleep.